Increases transketolase activity and important enzyme in glucose metabolism. Blocks three of the major molecular pathways leading to hyperglycemic damage. Prevents diabetes complications especially painful diabetic painful neuropathy. Benfotiamine alleviates dibetics induced cerebral oxidative damage. Prevents macro and micro vascular endothelial dysfunction and oxidative stress. Improves tingling, burning and numbness in lower extremities. A biguanide antidiabetic that works by decreasing the amount of sugar that the liver produces and intestine absorbs. Increases body's sensitivity to insulin in diabetes. Metformin may be the first therapeutic option in the diabetes mellitus type 2 with overweight or obesity, as it may prevent some vascular complication and mortality. 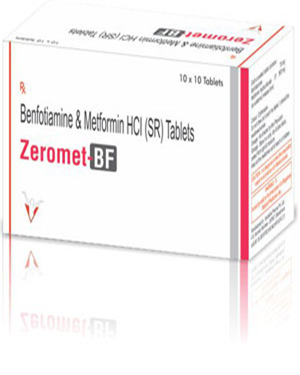 Metformin is the first-line oral medication recommended for glycemic control in the patients with type 2 diabetes. Metformin is the most commonly prescribed antihyperglycemic medication for diabetes and is the recommended first choice for oral therapy.